I think we over think party themes and decor sometimes. And some of my favorite ideas are actually really simple. Just sticking to a color or to an easy theme like polka dots. This "About to Pop" themed baby shower, stuck with a polka dot (I guess maybe bubble) theme for the decorations and food and it couldn't have been cute. 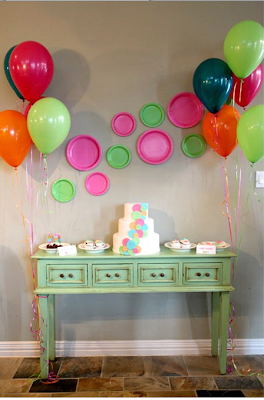 The paper plates on the wall might be my favorite idea. 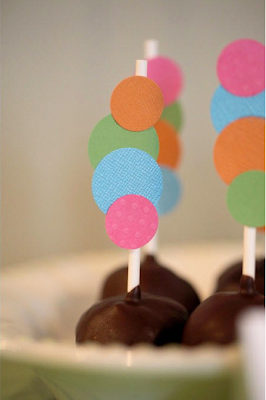 Followed closely by the brownie pop sticks. All the desserts are cute. You can see the rest of this super cute baby shower over at Celebrations at Home. So cute and simple! I agree...themes are getting a little out of hand sometimes! Love it! LOVE LOVE LOVE it! I have been looking for a theme for my daughters 12th birthday coming up...think I just found it, thanks! this is super cute, and I love how the theme is simple! LOVE the plates on the wall idea! Adorable! Love the cake and cupcakes! so sweet. That green buffet is cute.